Everyone, meet Stacey. Stacey, this is everyone. 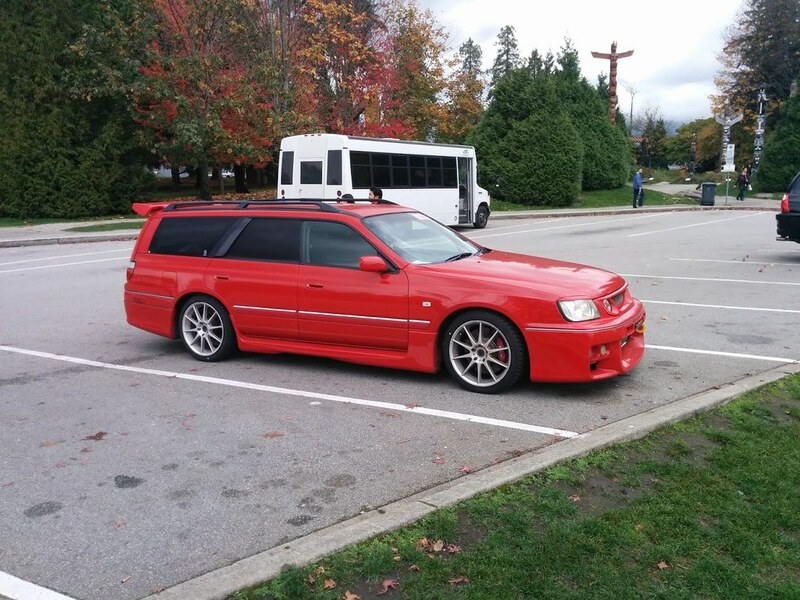 2000 Nissan Stagea RS Four S, 112,000km from Brave Auto. Just picked it up on Wednesday, going home to Calgary (and Edmonton) this weekend. Bushman, IMPUL, IanB and 4 others like this. Congrats on the purchase! Any immediate plans or just keep it as it is? I really like how red this is, but man, all these electronic add-on goblins all over the dash, this is looking to be a painful de-wire. This looks great. Congrats, what are your impressions? What an extensive mod list! This thing looks amazing! I'd love to see it in person some time. Awesome box, really nice purchase. Thanks guys! It was an interesting pick up. Went to the warehouse, battery was dead (not a big deal) but boosted from the rental with no issues. Drove down to the Chevron and filled up with 94 but left it running as I didnt want it to die again. Sure enough when I went to pull away from the station it died. I assumed it was to me letting the clutch out too soon/not enough gas. Stood around in the rain for a little bit with the hood up until 2 different nice people offered to boost me. Got it going again no problem and drove to the gas station exit where it once again died. This time I noted that as I put the clutch in and took my foot of the gas I watched the revs drop to zero. Damn. After frantically looking for another kind person to boost me, we got it going again and this time I was sure to keep the revs up. It was an interesting drive to the Tire Craft 2 blocks down the road, including it stalling one more time and starting it by dumping the clutch lol but I got it there in one piece. The guys down at Tire Craft were awesome, I already had an appointment to get new Bridgestone Blizzak LM-32 tires on, but the also replaced the battery and changed the oil. I would highly recommend them to anyone planning on getting new tires as they had good prices (free mount/balance made them cheaper then 1010 tire) and where super understanding. After that I got used to driving it a bit, I noted its only when you let the revs fall from a higher RPM will it stall. If the clutch is depressed below 2000rpm then it will return to idle normally. Would this have to do with different octane ratings? One thing I thought of considering it drove fine to the gas station. Any thoughts on this issue? Yes there are two cupholders between the front seats, albeit slightly small! The rear cupholders are right behind the center armrest, so they can be used by the front occupants without too much difficulty. I am working in Edmonton (Nisku) for the next year, and this will be making the trip back and fourth to Calgary so if you'd like to see it sometime, let me know! Yea I dont even know if I want to try to tackle that! Its got GPS sensors and a bunch of different sensors for what appears to be a radar detector built into the aftermarket rear view mirror, its got a little display that lights up when from time to time. It seemed sluggish at first but I think that was more to me driving it as if I was still in my diesel, and not using the full (read powerful) RPM range. I haven't done any launches but it certainly pulls well. I did do a few hard passing accelerations, and it does feel like the clutch may be on its way out, I think it slipped once or twice. It does run well! nice and smooth running on the highway. It is a biggg car, but good visibility out the back and sides. Brakes don't feel amazing (not much feel, pretty soft spongy feeling) but holy hell do they stop. I did one hard test brake on the highway and it very easily moved all the luggage to the front of the car! Steering is really nice, quite heavy but easy to handle. I was concerned the A/M coilovers would be too sporty, but the have quite good bump compliance so the ride isn't rough. Only the left rear sounds quite harsh when going over bumps, like a banging. It might be the spare tire or something, but I am pretty sure its on the left rear, maybe there is a rebound adjustment or something. The only other issue was just outside of Golden the gauge cluster died, with the speedo flopped over passed 180 on the gauge. Stopped in Golden, started googling it for 3 minutes and when I looked back up the needle was back at 0, so I started it up and everything was back to normal. It did it one more time 5 minutes before I got home, sounds like a bad connector or ground, has anyone else had this happen on a Nissan? Overall I am happy, but for now it is parked at home until I get an OOP done and registered. My 4 year old called a picture of your car a "hot wheels". You must get some awesome looks! Did you put winters on the 18"s? Glad you made it back with only some adventure. I would think that new fluids in the brembos might solve your issues with the soft brakes. Clutch, Mark said it seemed fine in that test drive video but an easy test is to apply the accelerator and brakes at the same time, see if the rpms climb without the speed. That dying issue seems weird, was it solved after the battery was changed? Watched the video on marks site sounded very healthy, hope you get all the kinks worked out and fully enjoy it! Banging in the left rear could be a strut mount or something loose from the suspension install, I'd have a look before driving too much more. Haha it is certainly ridiculous enough to be a hot wheels! Ill take that as a compliment, because no way can I take the car seriously. Yup, I put Bridgestone LM-32's (235/40/R18) on, they weren't cheap but that was the easiest way to make these my winter rims and get new ones for the summer. A little adventure is a good thing, right? I had that thought when I was driving home... It is parked for now until I can get the inspection done. It will be scary to think I drove all that way if that's the case! My parents CTS had a very similar noise which turned out to be a blown strut. With Marks help I was able to source a stock steering wheel with airbag so I can pass. Yea I might do that eventually, I have never bled brakes but I have heard its fairly straight forward? Yea Mark mentioned that the clutch was high (which it is) and it drives fine normally but when I did push hard it did seem to slip. If it is the stock clutch, its at the end of its life anyways. My Safari had the exact same symptom and that's why my engine is currently sitting on my garage floor lol. Thanks Man! They seem like nuisances more than show stoppers! Cant wait to drive it, and like you said for being modified it does sound healthy and it does drive quite smooth. You had to pull the engine to do the clutch on your Safari?!? That's a big job! Ill be posting about it in my other thread soon, but yea! Workshop manual says to pull the transmission and transfer, but owners say its better and safer to pull the engine. 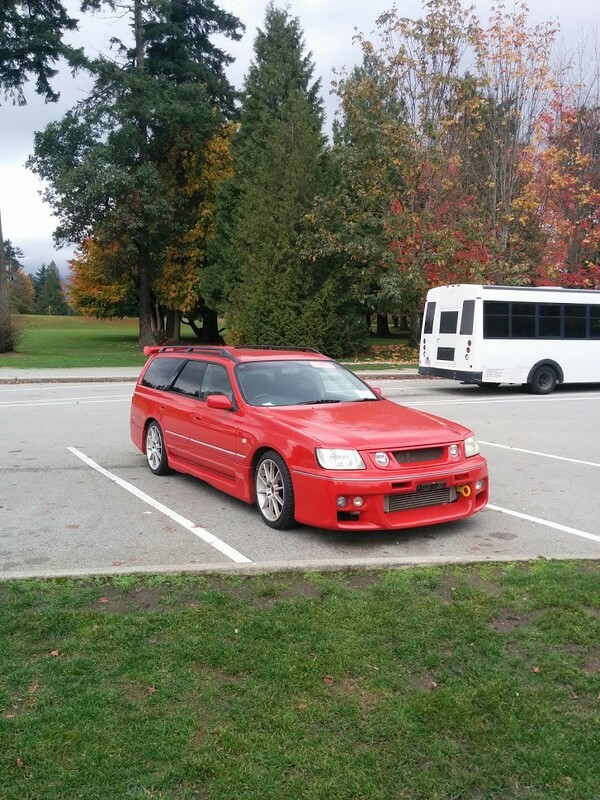 Nice Stagea! One day I want to own one of these. Does your car have an aftermarket BOV? I didn't read about one on Brave's site but I had an rb20 that has the same issue when the previous owner ran an aftermarket BOV straight to atmosphere. After getting on the throttle if I put in the clutch it would stutter and stall. Once I ran the stock recirculated valve the car drove flawlessly. Hmmm that is a good tip! My buddy installed a atmospheric BOV on his RB20 and it did that the first couple of times but then it seemed the ECU corrected it. Mine definitely has an aftermarket BOV to atm so maybe that is the issue. Thanks man!